I do, however, enjoy putting bunches of flowers together (although I think I’m not allowed to call them ‘bunches’ now that I’m *sort of* trained. I think I’m meant to refer to them as bouquets…) I’ve learnt some great tips about choosing flowers and putting them together, which I would have liked to have known before I started putting stuff together. Every time you have an empty vase, fill it with water and put a few drops of bleach in it and leave it overnight (although I forget and sometimes leave it a few days…) Empty it and rinse it out. This will kill any bacteria and means that you’re starting with a clean, germ-free vase. It’ll mean that your flowers last longer from the get-go. In a similar vein, make sure you change your water every couple of days. Some people swear blind that a drop of bleach in the water works to keep flowers looking fresh, although I would only do that for roses; for anything else I use a teaspoon of sugar or, if I have it, the packets of flower food you get with supermarket flowers. 2. There’s nothing wrong with supermarket flowers! I do love going to the florist, but it is expensive. There’s nowt wrong with supermarket flowers- I use them quite a bit for class, and a florist recently recommended I buy focal flowers (i.e. the main flowers in an arrangement) from a florist, the secondary flowers from a supermarket and the greenery from a garden. To be honest, it depends on time/money as to whether I have time to do all of that. But you can definitely gussy up a couple of bunches of Aldi’s finest- arrange them in a symmetrical pattern, twisting the stalks if you can, any foliage on the outside, and tying off with string. Chop the bottoms of the stalks off evenly- et voila! A tied bouquet! The only thing I would say is that supermarket flowers do not tend to last as long as florist bought flowers, but when they’re cheap as chips, who cares? I think one of the reasons I’m not terribly good at the lessons is that I’m not very keen on the formality of what we’re being shown. This is just my thing and no judgement on the teacher (who I love) or the whole world of floristry. It’s just me being an awkward sod. I tend to prefer smaller arrangements that suit a more vintage taste, which have a country garden look to them. This is what I will continue to make once I finish my course, and what I enjoy making. As one of Brighton’s top florists told me, ‘It’s not rocket science and there are no hard and fast rules.’ (He was quite dismissive of a lot of the formal structure of floristry- and seeing as he did my wedding bouquet, I tend to trust him!) One thing I would say: supermarket flowers tend not to smell much. If you want that, consider buying some broom or something like stocks from a florist- even one stem of these will lift your bunch of flowers into something a bit more special. Eucalyptus is having a moment. You can get the traditional varieties, with large silver leaves, or the smaller leafed variety, which is in the arrangement above. The good thing about eucalyptus, especially the bigger type, is that it will literally make any bunch of flowers look more expensive. Probably because it is quite expensive, but it would be a price I would consider paying for something special. To be honest, though, I’d just have vases full of it round the house I love it so much. If you want nice foliage, consider pistachio leaf, which is nice and half the price. Foliage is super important and I almost never have enough. If you want to make something look vintage, go with wax flowers. These tiny pink or white flowers are a bit of a discovery for me and also seem to be having a bit of a ‘moment’. Oh my god, I love them. They look like something from a Victorian wedding and they last an AGE. They aren’t hugely cheap, but they are cheerful and really add something to the flower arrangements I make. These would go in my vases with the eucalyptus. I have a Pinterest board where I keep all things floristry- I love looking at flower combos, as well as different colours and presentation options. 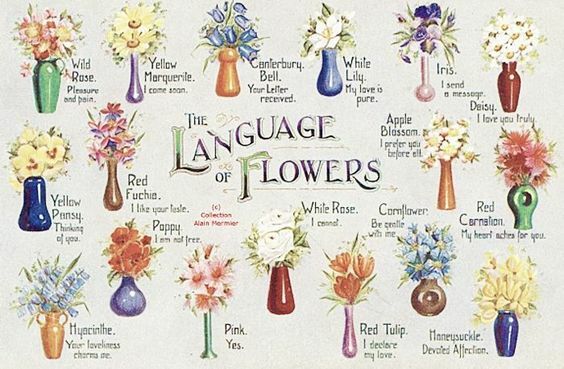 I’m also obsessed with the language of flowers and what different flowers meant in Victorian times. I then use this as a starting point for ideas. There are also some really great Instagram accounts run by florists, with different styles and specialities. Have a hunt around and find your style. Then, go and have a go. It’s really, honestly, not that hard. Seriously- look at some of the mistakes I’ve made! If there’s anything you’d like to know, but I may have missed, let me know either in the comments or on Twitter. Enjoy your flowers! I am SO EXCITED about this year’s Seedy Sunday– it’s the first year I’ve had a garden that’s mine and I have a rough idea about how the garden will eventually take shape. I’ll probably go into more detail about that in a future post though. 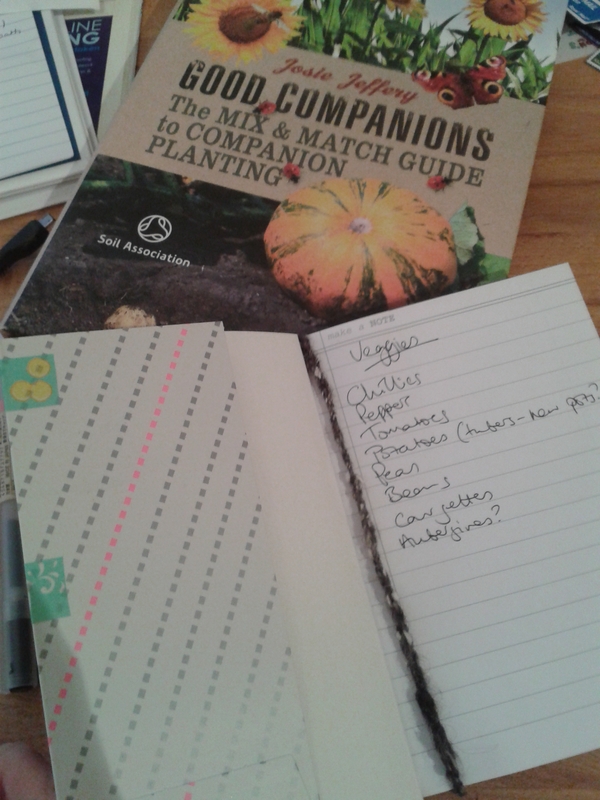 My short term aim is to get the stuff needed for fruit and veg in the garden. This will more than likely be grown in pots and growbags this year, so I’m looking for small, compact plants; I’ve already ordered some blueberry and tomato plug plants and I’ve got my eye on some potatoes too. My wishlist has some specifics (heirloom tomatoes, broad beans, peas and sweet peas) and some ‘maybes’ (aubergines, strawberries, raspberries) as well as some things I need to look into a bit more, like foxglove seeds. I’d also like to get some sunflowers for D. As you can see from the book above, I’m also interested in companion planting, so I expect some nasturtiums and marigolds will be among my purchases. 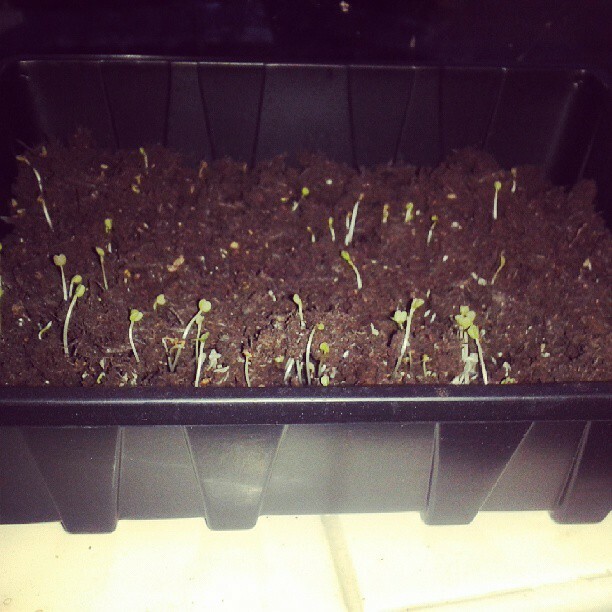 As well as planning for outside, I’ve begun growing ‘micro greens’ indoors. We spend a fortune on salad, so I’m doing what I can to alleviate that! So I might pick up some kale and other leafy greens to grow as cut and come again leaves. The batch I planted last week had already started to show by two days later, so I’m hoping for more success! I can pretend I’m sort of healthy then, can’t I? The crocuses are up, the daffodils are showing themselves (although, as I recently admitted on Twitter, they are my least favourite flower. Apart from those teeny ones. I like those…) and the sun decided to come out today. It is lovely in Brighton and we took D to a soft play centre which also happens to be in a garden centre. While Benn’s mum watched D, we moseyed round- me enthusiastically choosing seeds and Benn wandering around with the bemused air of a teenage boy accompanying his first proper girlfriend round Oxford Street Topshop. 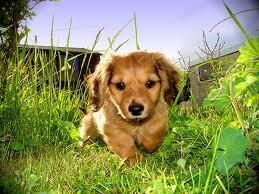 Here is a cute puppy in a garden in spring. It has nothing really to do with this post. The thing is, after months of rain and no prospect of snow, I have decided to fully embrace spring. After all, it is nearly my birthday (which happens in the early days of the season) and also we’re in limbo with the house buying at the moment. I need to do something to cheer me up. So, plant stuff it is. I’m also looking for new spring clothes and shoes- I have my eye on a pair of Lotta from Stockholm sandals, as my dearly beloved Birkenstocks finally gave up the ghost last year. So of course- new sandals mean new skirts, right?! I’m also switching my home scents around; I’ve gone from heavy, spicy and sweet winter-y scents to bright, floral spring scents. I’ve been buying loads of No Mess wax melts from Busy Bee Candles and I’m currently melting Violet and Lime, which makes the house smell of Parma Violets. I also have Peony (which I had as one of my wedding flowers.) I’ll do a full review of my favourites from Busy Bee soon. How are you preparing for spring? Yesterday, I went to the annual event known as Seedy Sunday for the first time in a couple of years. I’ve been deciding what I want in the new garden (our current garden isn’t brilliant) and reading up on bee-friendly plants. As much as I would like to grow fruit and veggies this year, it’s not really practical to plan a long-term garden when you don’t know what you’re getting! So, I decided to choose annual plants to pretty up the garden and smell nice. 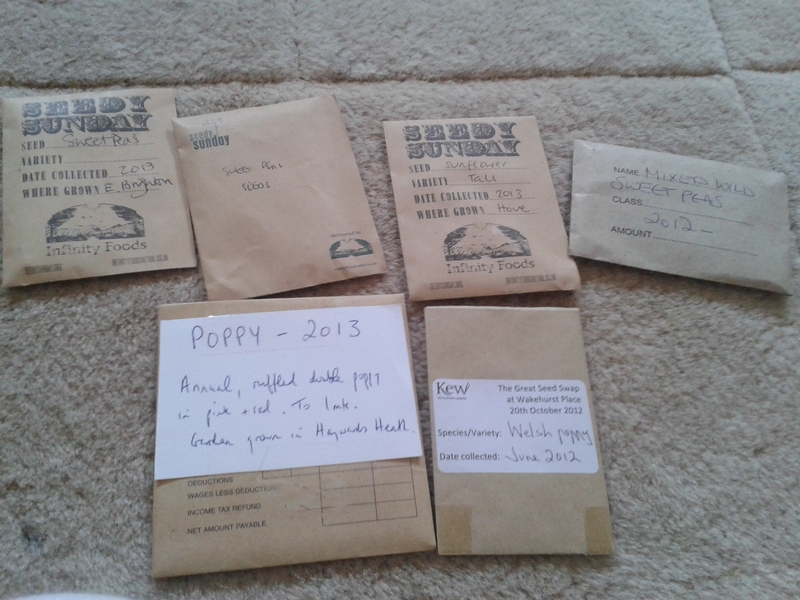 The primary point of Seedy Sunday is as a seed swap; you can take your saved seeds to swap, or if you’re like me and don’t have any seeds to swap, you can buy donated seeds for 50p a packet. I came away with three packets of sweet peas (my fail-safe flower to grow, they are SO easy and pretty), a pack of sunflower seeds and two packets of poppies. I was particularly drawn to the Welsh poppies, considering I am half-Welsh! I’ve never grown poppies or sunflowers, so I look forward to seeing how these turn out. The sweet peas are also a bit of a mystery- I have no idea what varieties or colours I have. 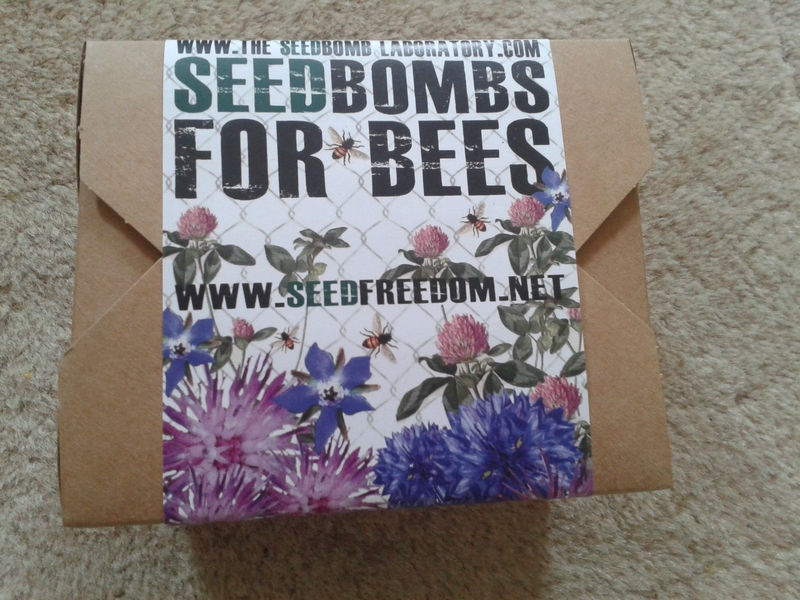 This was £6 and is the purchase I am probably most excited about; inside are six seedbombs of plants and flowers chosen to encourage bees. I figured these would store well and be a lot of fun to plant and see grow once we move. You can buy them here (although they’re a bit more expensive!) When I come to sow them, I’ll let you know how I get on. 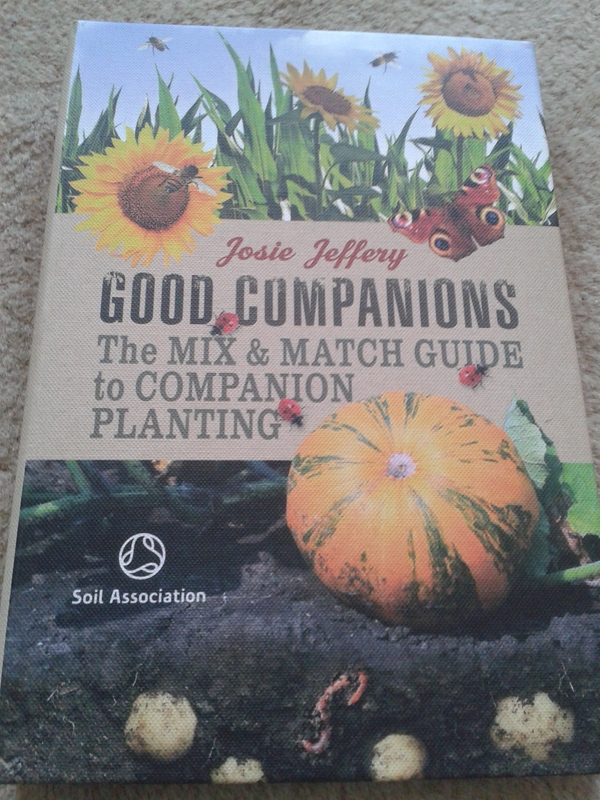 Josie Jeffrey, the person behind the Seed Laboratory has also written some great books; I picked this one up which reminded me of a children’s book I had as a kid- the pages are split into three and you can work out which plants work well with each other. This is a book for more future planning, but I have her book on seed collecting and swapping on my Amazon wishlist already! I’m starting to wish spring (and the move) would come quickly now! One of my favourite cafes in Brighton is Metrodeco. I love its cool, authentic vintage vibe and their range of amazing teas that have been exclusively brewed for the cafe. It also became the place Benn and I would visit after the endless hospital visits when I was pregnant (when we found out we were having a boy, we told the people in the cafe and got a round of applause!) Although I love their teas, I have a special place in my tea cupboard for Parisian Floral Calm. As a rule, I generally don’t like chamomile-based teas, but I make an exception for this infusion! It’s made of chamomile, lavender, jasmine, lemonbalm and rose petals (I may have missed something…) and has a wonderful floral smell- it really is amazing. It’s sweet and herbal, the lavender gives it a depth and the jasmine and rose give it a perfumed note. Not your average herbal tea at all! I brew it for a couple of minutes, so that it suits my taste; I like this to be smooth and not overpowering. It’s definitely a chamomile tea, but I find the rose petals give it a hint of juiciness and sweetness. My favourite time to drink this is when I’ve put the baby to bed for a nap- I need some ‘me’ time and I am usually frazzled by 10 am (when he’s been up for at least four hours! A baby who is into everything is HARD WORK!) I find the flavour is very calming- a good cuppa for reading a good book. Or in my case, taking to work for when I want to forget about my stress! The teas are hand-sewn buds of premium green tea with blossom (either jasmine or rose) in the middle. You prepare them by placing the bud into hot water and watching it slowly unfurl. By the time it has uncoiled, you should have a perfect cup of tea. I tried taking pictures of the tea, but they were rather unimpressive, so I’ve borrowed Eteaket’s gorgeous photos to show you the potential of the teas. Although my buds didn’t quite open as gorgeously as they do in the photos (I was using a small glass teapot, which meant that the buds could float around a bit), there’s still something wonderful about watching them open to reveal a tiny flower inside. The benefit to brewing the buds in a teapot is that you can see the flower emerge and then pour off the tea. I’m not a fan of leaving green tea too long after brewing, as I find it gets too bitter for my taste. By waiting for the tea to open, the flavour is perfect. My favourite of the two is the jasmine, which is unusual for a self-confessed rose addict. Unlike a lot of commercial jasmine teas, this one is not heavily over perfumed; the flavour is clean and crisp. I think that this would be a wonderful palate cleanser for a dinner party. As a result of this trial, I am extremely tempted to buy some of Eteaket’s Jasmine Chun Hao tea. I’m a jasmine convert. Visually, the rose is my favourite- when you see the pinky red start to erupt, it’s really cool! Flavour-wise, again, it’s lovely, very fragrant and floral. I found that the time it took to fully open (I wish I’d timed it) meant that the tea was perfect. I’ve spoken before about how rose tea in particular can be over-brewed quite easily; this was done to perfection by the time the rose petals emerged. This is a definite for rose fans. It’s just, for me, the jasmine has slightly more of an edge and I can see more people liking it. Click here if you'd like my ramblings delivered straight to your inbox!